For decades, children’s nurses Lucy Andrews and Karen Higgins worked tirelessly in the NHS. During their careers their paths often crossed, including a time when they shared an office. They often discussed the problem of children and young people with complex conditions who were effectively growing up in hospital even though they were medically stable. Either their care was too complex to be provided in the family home, or they were waiting for their homes to be adapted for their needs. She adds: ‘We have experienced, again and again, delayed discharges and children and young people growing up in hospital. After a particularly bad day, they met for a coffee and soon began talking about how they could deliver a cost-efficient alternative. ‘We believed we could demonstrate significant potential cost savings to deliver a service that meets the holistic and developmental needs of the child and family,’ says Ms Andrews. 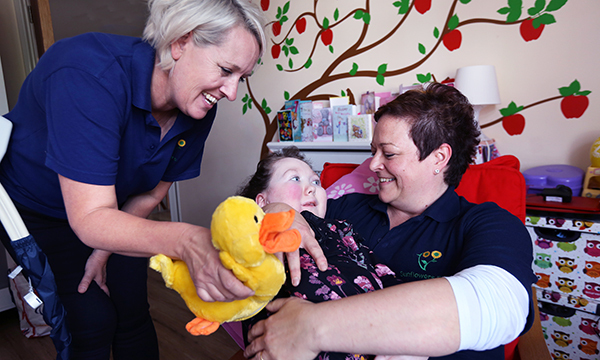 They decided to create Sunflowers Care – a nursing home from home for children and young people with complex needs, including long-term ventilation. RELATED: Lucy Andrews and Karen Higgins were finalists in the Child Health category of the RCNi Nurse Awards 2017. Watch them describe their home from home. They set aside a day a week to do their research and plan. ‘It wasn’t easy,’ says Ms Andrews. ‘We worked tirelessly to realise our shared dreams and vision. ‘Karen and I were seeking a property, securing funding, and starting up a business – despite having no previous business experience – and fully adapting and converting the property while working full-time in our NHS roles. Ms Higgins adds: ‘We researched what we were doing very thoroughly. We went to conferences to clarify that what we thought was missing was actually missing. It is crucial to make absolutely sure that there is a gap in services, and be clear that there is demand for the service you are planning. Ms Higgins advises anyone thinking of launching their own service to make sure they have the backing and support of family and friends. ‘Once we had sourced the building, with their support we converted it to meet multiple regulations and decorated it to ensure it is safe, child-focused and welcoming,’ says Ms Andrews. The nurses have found that at Sunflowers they can be more responsive to children’s needs. Ms Higgins explains: ‘We can change things very quickly. That was one of the most frustrating things about working in the NHS, and is one of the very fulfilling parts of our new role. We can make decisions quickly and for the direct benefit of the children. It is a dream come true sometimes. 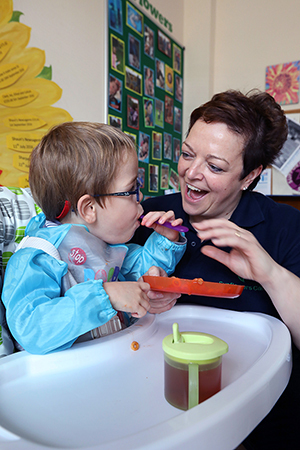 The care at Sunflowers is intensive and funding comes from a variety of sources. Parents might fund short-break care. One little boy spends a night at Sunflowers occasionally so his parents can go out together. Some use their personal care budgets. Other care is funded by the NHS, clinical commissioning group or social care, depending on the reason for the child being at Sunflowers. For example, if the child is waiting for community professionals to be trained or their home to be adapted, the funding might come from the NHS or social care budgets. The lack of care for this group of children is a national problem, says Ms Higgins, but for now she and Ms Higgins are not planning to expand by opening another home. They are looking instead at supporting children who have lived at Sunflowers when they go out into the community. They are currently considering supporting a school nurse at an academy that has a pupil with complex health needs. They have no regrets at all about making the leap to quit the NHS and start their own service. It has been extremely busy but is incredibly rewarding, says Ms Higgins. ‘It was a big jump but we still have contact with the NHS. Lots of our staff also still partially work for the NHS, and we still work with a lot of our old colleagues. ‘My advice to anyone who thinks they need to leave the NHS to fill a gap in patient care is to just do it. If you think about it too much and too long you will talk yourself out of it,’ she adds. The nurses began working at Sunflowers full-time in June 2013, with their team starting work in the August. However, they did not accept their first patient until October of that year. It can still be feast or famine, says Ms Andrews, but the team uses the quieter times for training and updating competencies. Students also come to them for clinical placements. 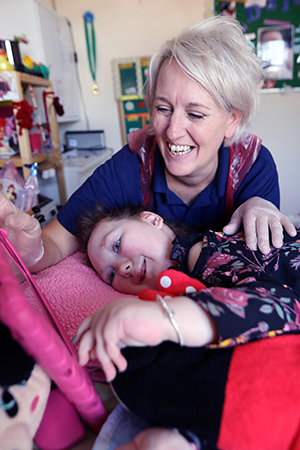 Another girl did not communicate at all when she arrived at Sunflowers, says Ms Higgins, but by the time she left she was fluent in the Makaton system, which uses signs and symbols as well as speech. ‘The communication is crucial, as the children are able to get some of their needs across, ' says Ms Higgins. 'It can be so frustrating for all when you don’t know what they are trying to tell you. The search for the best in nursing is under way, with entries open for the RCNi Nurse Awards 2018, the profession’s top accolade. The awards offer a chance to nominate a colleague or team for their outstanding contribution to care, or share excellent practice with the wider nursing community. Winning can raise the profile of a specialty or the challenges faced by a particular patient group. The 14 categories celebrating the breadth and depth of the profession are open to nurses, midwives and health visitors registered to practise in the UK, nursing students and those working in health support roles, such as healthcare assistants and assistant practitioners. The winners will be announced at a ceremony at the Park Plaza Hotel in Westminster on 4 July. The RCN Nurse of the Year, chosen from the category winners, will be revealed on the night. Lucy Andrews and Karen Higgins were finalists in the Child Health category of the RCNi Nurse Awards 2017. Find out more about the other initiatives short-listed in their category, as well as the award-winning project, here.